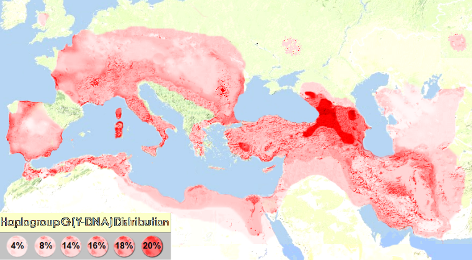 The haplogroup G distribution in Eurasia. An Y-DNA Haplogroup G discussion group. Haplogroup G descends from haplogroup F, which is thought to represent the second major migration of Homo sapiens out of Africa, at least 60,000 years ago. While the earlier migration of haplogroups C and D had followed the coasts of South Asia as far as Oceania and the Far East, haplogroup F penetrated through the Arabian peninsula and settled in the Middle East. Its main branch, macro-haplogroup IJK would become the ancestor of 80% of modern Eurasian people. Haplogroup G is formed approximately 50,000 years ago as a collateral branch of the basal paragroup HIJK*, that not has been identified in living males or ancient remains, but from which sprung the haplogroups H, I, J, K, L, M, N, O, P, Q, R, S and T.
The most probably region of the initial phase is estimated to be in Anatolia, Armenia or western Iran. For this are several indications. First, here is the only region with co-presence of deep basal branches as well as the occurrence of high sub-haplogroup diversity of haplogroup G.
Furthermore there is the similarity between the mtDNA haplogroups found in archaeological remains of the first European immigrants after the Ice Ages and the archeological mtDNA found in Anatolia. They have the highest resemblance of mtDNA in the world. This map of Europe and Asia Minor shows the probable area of the beginning time of Haplogroup G in green. The decreasing spread of this group is indicated by fading from a dark to lighter green, to yellow and then to brown. In various regions of the Near East, the so called Fertile Crescent, lived hunter-gatherers. The two best known groups are the the Baradostian, 34,000 – 20,000 ybp of the Zagros Mountains of western Iran and the Levanto-Aurignacian, 27,000 – 20,000 ybp in the Levant. These hunters were evidently migratory throughout the territories they occupied; of permanent occupation there is no trace. Here lived Our G forefather and his descendants only split round 27,000 ybp in two subgroups. G1 probably on the east side of the community, G2 in the central and western part. G2a-P15 came again much later. It was formed 20700 ybp and had a TMRCA of 18000 ybp. Slowly they grew in the Fertile Crescent region as a proto-agrarian semi-sedentary hunter gatherers society. First in the warm and moist Bølling-Allerød interstadial, 14,700 to 12,700 ybp there was a rapid population growth in G and as a result emerged many subgroups. They lived in a population with Pre-Pottery Neolithic Culture which existed there for about 4 milennia. 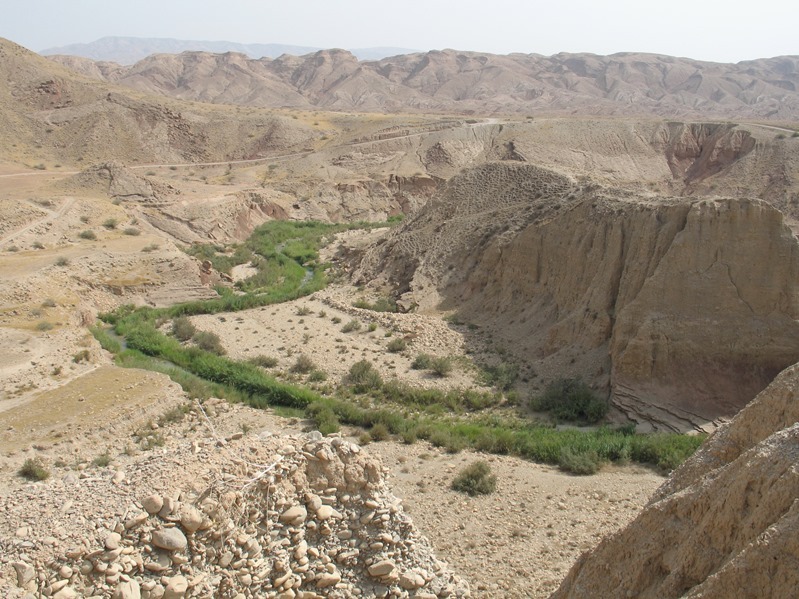 Around 10.000 ybp the earliest archaeo-botanical remains of long-term plant management in the world appears in the Fertile Crescent. It is a domesticated-type "Emmer wheat". As a result of population pressure and possible lack of food the G People leaved the region and spread in all directions, to Pakistan, to the Caucasus and westward to Europe. They brought the farming culture in Europe and Asia. G1 which probably lived somewhat separated apart moved eastward to the Indus and from there North to Kazakhstan. The G2a1 groups went to the Caucasus. The G2a2 and subgroups spread westward to Turkey and Europe, G2b went eastward to central and southern Asia. The beginning of expansion to Europe was already before 8500 BP to three regions in west Anatolia: the lake area near Antalya, the coasts on both sides of the Aegean sea, and in the Northwest of Anatolia around the Marmara Sea at Barcin Höyük. The people of Haplogroup G entered Western Europe about 8000 ybp with G2a2-L1259. They were divided in two subgroups, namely G2a2a-PF3147 and G2a2b-L30. They came through two different routes, one by sea, the Mediterranean group and one across the country, the continental group. Two thousand years later G2a2b2a1-L140 came from Russia as part of the Yamna culture with the Corded Ware culture. This group caused the downfall of their G predecessors, which almost disappeared from the continent except in some remote mountainous areas and Mediterranean islands. G-L140 however still lives in Western Europe and has been spread from there with the Settlers to America. 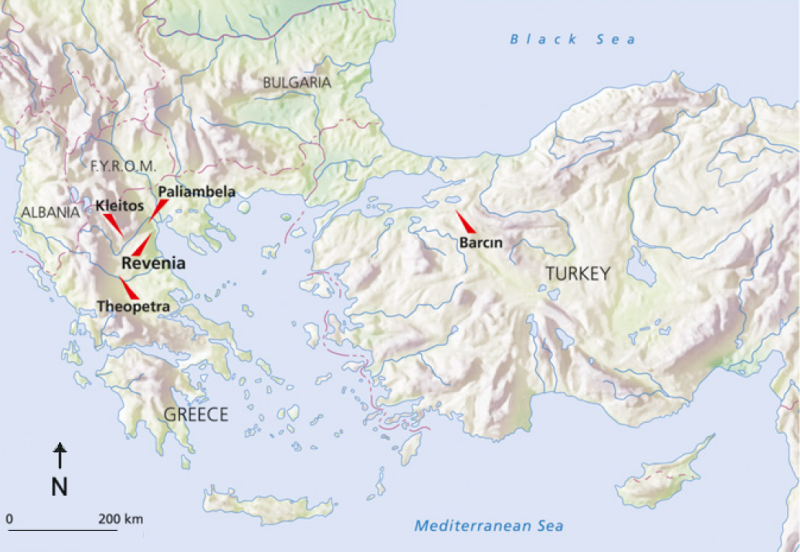 The very earliest Neolithic Farmers got to Europe at Revenia in Greece around 8,600 ybp. They went through Macedonia to Serbia and Bulgaria through the valleys of the Morava and Danube to Hungary. They reach the Hungarian plain 8000 years ago. Here are many archaeological finds of them, they continue along the Danube and the Rhine to Western Europe. By the characteristic decorations of their pottery this is called the Linear Band Culture, LBK. 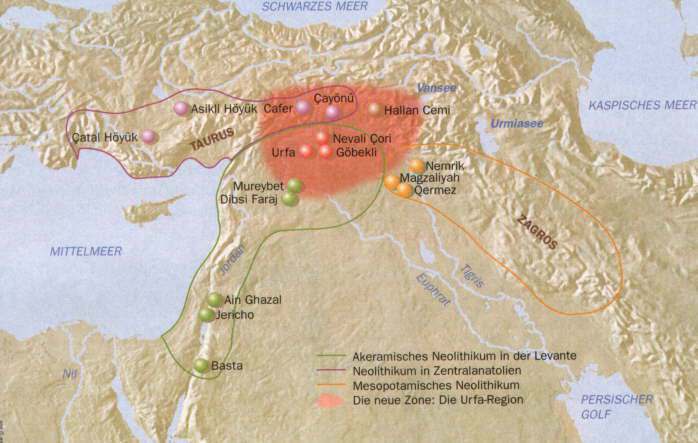 The majority of the Early Neolithic Farmers in central Europe was G2a2a. This is found in a number of consecutive Neolithic cultures, the Linearbandkeramik (LBK), flourishing about 7500-6500 ago in Germany and Italy, the Rössen Culture (RSC) flourishing about 6,400-6250 ybp, Bell Beaker culture (D: Glockenbecher-Kultur) flourishing in Europe and England from between 4850 and 4140 ybp. This remained common in many places down to the start of the Early Bronze Age around 5200 ybp when we find Ötzi and the many G2a's from Treilles in Aveyron, in Southern France. In southern Limburg, the Hesbaye and Condroz, the LBK culture flourishes from 7,500 years BP. They meet the Hoguettians here. Through Lorraine, a branch went through the basin of Paris to the Channel and Hainaut. A part goes in France north along the Rhône and Loire to the Atlantic coast. Their characteristic pottery found in Normandy near La Hoguette. These Hoguettians are also found across the Rhine at Stuttgart and Worms. They were also in South Limburg where they lived next to the continental LBK branch. They may have arrived at the same time. It is very likely that many of these have taken the crossing to Britain, included Ireland. They will have taken the shortest crossing near Calais. The British Neolithic farmers were genetically comparable to contemporary populations in continental Europe, and especially to the Neolithic Iberians, residents of the Spanish east coast, suggesting that some of the peasant families in Britain came along the Mediterranean and not the continental way along the Danube. G2a people may have been the first modern humans who had acquired the alleles for fair skin. This is seen in an Early Neolithic farmer from Germany who possessed the same alleles for fair skin as the modern Europeans nowadays, while in an archaeologic found of a G2b man in the from Wezmeh Cave in Zagros, Iran, who was from ± 9,250 ybp, this was far lesser. He had a relatively light skin and black hair, contemporaries in this region were also partly light, partly medium tinted. A hunter-gatherer from northern Spain as recently as 7,000 ybp, tested by Olalde et al. 2014, was still dark skinned. Suddenly in the Bonze Age G becomes rare in Europe. From 6.000 ybp new peoples came from the Pontic-Caspian steppes with new cultures and they brought new Y-DNA R1a and R1b and also in lesser amounts new mt-DNA. The old G subgroups were replaced, but in lesser amounts by G2a2b2a1-L140. The former G clades remained mostly in remote places as the mountain areas and the Mediterranean Islands. Turkey, Israel both Jews and Palestinians. The extremely high concentration of Haplogroup G around the Caucasus is noteworthy, especially in Northern-Ossetia-Alania. It is assumed that there was an ancient European core population which belonged to Haplogroup G, but which was later repressed by Neolithic newcomers from other Haplogroups, particularly by haplogroup R1b. The G clades among the steppe peoples of southern Russia are a later replenishment. In Europe G comprises 5% of the population, in France and the Benelux this is about 4%. In Belgium, the presence of Haplogroup G, is about 10% higher then in the Netherlands, and there is a clear difference between the northern and southern parts of the Netherlands: Belgium is 4,1%, but the Netherlands is 3,7%, with most of these being found in the southern part of the country. Branched off from Haplogroup F about 50.000, ybp. G1-M342, formed 26.000 ybp, TMRCA 18,600 ybp, has its highest concentrations in Iran, most are in the Near East, South Asia, Central Asia, and East Asia. G1a-CTS11562, formed 18600 ybp, TMRCA 14800 ybp. G1a1-BY1124/GG353, formed 14500 ybp, TMRCA 13200 ybp. G1a1a-Z3353, formed 13200 ybp, TMRCA 13200 ybp. G1a1a1-L1324, formed 13200 ybp, TMRCA 4800 ybp and is found among Ashkenazi Jews, Bulgarians, Kazakhs, Mongols, Kuwaitis. G1a1a1a1-L201, formed 4800 ybp, TMRCA 475 ybp, Ashkenazi Jews of Europa. G1a1a1a1a~FGC39025, Ashkenazi Jews of Europa. G1a1a1a1b-Z45735, Ashkenazi Jews of Europa. G1a1a1a2-GG1, Mongols in Mongolia, formed probaly 5,000 ybp..
G1a1a1a3-Y14914, formed 5000 ybp. Kuwait, Syria. G1a1a1a3a-Y15524, formed 1700 ybp. Kuwaitis. G1a1a1a3a1-Z35053, formed 600 ybp. Kuwaitis. G1a1a1a3a2-Z35057, formed 600 ybp. Kuwaitis. G1a1a1a3b-Z35061, formed 1700 ybp. Syrians. G1a1a1a4-444585, formed 1700 ybp. Syrians. G1a1a1b-L1323, formed 4800 ybp, TMRCA 750 ybp Kazakhs, Argyn. G1a1a2-GG362/Z3189, formed 13300 ybp, TMRCA 9400 ybp, Slovakia, Germany, Turkey, India (Gujaratis), n.e. Europe (Ashkenazi Jews), Kazakhs, Argyn, Iran, Arabia. G1a1a2a-Z26332, formed 9.400 years ybp. G1a1a2a1-Z31483, Slovaks, formed 9.400 ybp. 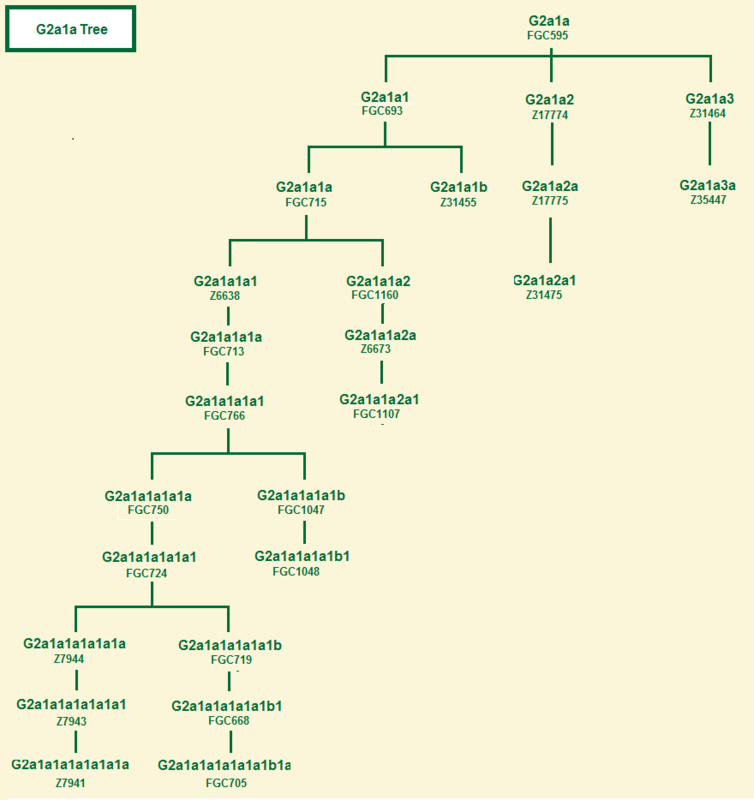 G1a1a2b-Z31492, Gujaratis of India, formed 9.300 years ybp. G1a1b1-GG167, formed 9600 ybp, TMRCA 8900 ybp, Saudi Arabia. G1a1b1a-GG162, formed 8100 ybp, TMRCA 5700 ybp, Brazil, Iran. G1a1b1a1-GG157, formed 550 ybp, TMRCA 375 ybp, Bashkirs of Bashkortostan. G1a1b1b-Z44602, formed 8100 ybp, . G1a1b2-GG272, formed 9200 ybp, TMRCA 6900 ybp Kuwait. G1a1b2a-GG270, formed 7,000 ybp, TMRCA 3000 YBP, Saudy Arabia. G1a1b2a1-GG265, formed 3,000 ybp, TMRCA 1200 YBP, Saudy Arabia. G1a2-F2885, formed 14900 ybp, TMRCA 8400 ybp, lebanese, English, French, Nepalese, Brahui, a Han Chinese. G1a2a-BY21302, formed ybp, TMRCA ybp. G1a2a1~A454,2/ZS1981.2, FGC7391.2, formed ybp, TMRCA ybp, . G1a2a2~Z45001, formed ybp, TMRCA ybp. G1a2b~BY184767, formed ybp, TMRCA ybp. G1b-L830, formed 18600 ybp, TMRCA 8500 ybp, an Saudy Arab. G1b1-Z17874, formed 8500 ybp. TMRCA 2900 ybp. G1b1a-Z18606, Bulgaria, Ashkenazi Jews of Europa, 5.000 years. G1b1b-Z30744, formed 2900 ybp, TMRCA 550 ybp, Kuwaitis, Quataris. G1b2-BY165821, formed 18600 ybp, . G2-P287/PF3140, formed probably in the fertile crescent about 27,000 years ago. G2a-P15/PF3112, is assumed to be about 20,500, years old and started expanding after the Ice Ages, 14,500 ybp. Of the European archaelogic DNA 20% has these original clade; together with his subgroups they make 60% of the Earliest Neolithic European DNA. G2a1a-FGC595/Z6553, (former L293) (herein or in subgroups) Uyghurs, Uzbeks, Karakalpaks, Bashkirs, Kumyks, Karachays, Tatars, some among Hungarians, Czechs, and Bulgarians and Kalash and Brahui. G2a1a1-FGC693/Z6653, formed 10,500 ybp. 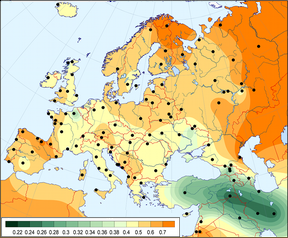 12% of the people in the North and Northwest of Georgia with a tMRCA of 7,500 BP, is of Neolithic origin in the Caucasus. spread probably with the Christian Ossetians eastward to China and Mongolia. G2a1a1a1a-Z6638, formed 3,900 ybp, in Ossetians, Armenians, Abkhazians, Georgians, Karachays, Lezgins of Dagestan, English, Moldavians, old 4.5 ky.
G2a1a1a1a1a1a-FGC724/Z7940, formed 4400 ybp, TMRCA 4300 ybp, in subbranches are people from Trabzon who are likely originally of Kartvelian "Sanni" (Zan) origin and Svans. G2a1a1a1a1a1a2-FGC719, formed 4300 ybp, TMRCA 750 ybp, one Libyan and one Bulgarian. G2a1a1a1a1a1a2a3-FGC690/GG332, formed 750 ybp, TMRCA 750 ybp, Ossetians. G2a1a1a1a1a1a3-Z40550, Northeastern coast of Turkey and an Abkhazian. G2a1a1a1a1a1b-Z31459, formed 3.900 ybp, Georgians, with whom Dzhugashvili (Джугашвили), better known as Stalin (Сталин). G2a1a1a2-FGC1160, Europe (Ashkenazi Jews), Russia (Karachays, Lezgins) . G2a1a2-Z17774, Italy, England, Pakistan (Punjabis). G2a1a2a-Z17775, Punjabis of Pakistan, Spaniards, Italians. the Dutch family Pennings having a 13th century ancestor van der Straetten in Oirschot, Brabant and Italians, 7.0 KY.
G2a1a3-Z31464, 10.0 KY, Europeans, Germans. G2a1b-Z30702, Germans, age 16,200 years. G2a2-L1259, age circa 18,200 yrs, from which two lines with a TMRCA of 17.000 ybp: G2a2a-PF3147, and G2a2b-L30. G2a2a-PF3147, formed 16.800 ybp, TMRCA 11.800 ybp ,is the smallest of the two subgoups of G2a2. It has with its subgroups 10% of the European G. It arose round 16.800 years ago probably in what later became the first Neolithic areas of Anatolia and spread with other G groups, G-L30 and subgroups, ca 8000 ybp mostly around the Mediterranean along the South and the North coasts and the Islands as Sardinia and Corsica, and in the Balcans and Bulgaria. and is still found now in low percentages, and eastwards to Iran and Azerbaijan. However it is absent in the North Caucasus. G-G/PF3147* is still found in Turkey, Greece, France, Britain, Germany and Bahrain and in LBK Neolithic sites in Germany, but also in Central Asians, Uzbeks. G2a2a and its clades, are also treated on the Clade G2a2a page of this website. G2a2a1-PF3148, formed circa 12,500 ybp, find in an 7,100 year old archaeological LBK site in Halberdtadt, Germany; today in Wales (Roberts) and Pakistan. G2a2a1a-PF3177, formed 11,500 ybp. PF3177* is in Italies Retic Alps, Sardinia, an English American and an Egyptian. G2a2a1a1-FGC6669, formed 10.900 ybp, TMRCA 10.000 ybp. It looks that this clade did not take part in the entry into Central and Western Europe in the beginning of the Neolithic, but remained in the eastern region of the Mediterranean. In Roman Time they assumely spread over the Roman Empire. One known FGC6669* is an Italian from Sardinia. G2a2a1a1-FGC6619, FGC6663, formed 10.000 ybp, TMRCA 7.500 ybp, one known FGC6663* is from the Krasnodar district (Краснодарский край) in the Northern Caucasus in Russia. G2a2a1a1~Y14935, formed 7.500 ybp. TMRCA 7,500 ybp, One known Y14935* is an Saudi Arabian. G2a2a1a1a-FGC58131, formed 7,500 years before present, herein one Armenian family. G2a2a1a1a1-M286, formed 7,500 ybp, TMRCA 4,400 ybp, now in Turkey, Georgia, Cyprus, Lebanon, Syria, Armenia, Germany (Mecklenburg-Vorpommern), France (Strasbourg) England and Scotland. G2a2a1a1a1a-FGC58189, formed 3,300 ybp, TMRCA 3,000. G2a2a1a1a1a1~FGC58118, formed 3,000 ybp, Suffolk, England. G2a2a1a1a1a2~FGC59473, formed 3,000 ybp, TMRCA 1200 ybp. G2a2a1a1a1a2b~BY193531, formed 3,000 ybp, Oman (Q). G2a2a1a1a1b~Z43080, formed 3,000 ybp, TMRCA 500 ybp, England. G2a2a1a1b-FGC6618/FGC6666, formed 7,700 ybp, TMRCA 1300 ybp, , in these sprote later three families during the transition period from Merovingian to Karolingian time in the pagus Hasbania, now Namur (Belgium) and Maastricht (Netherlands). 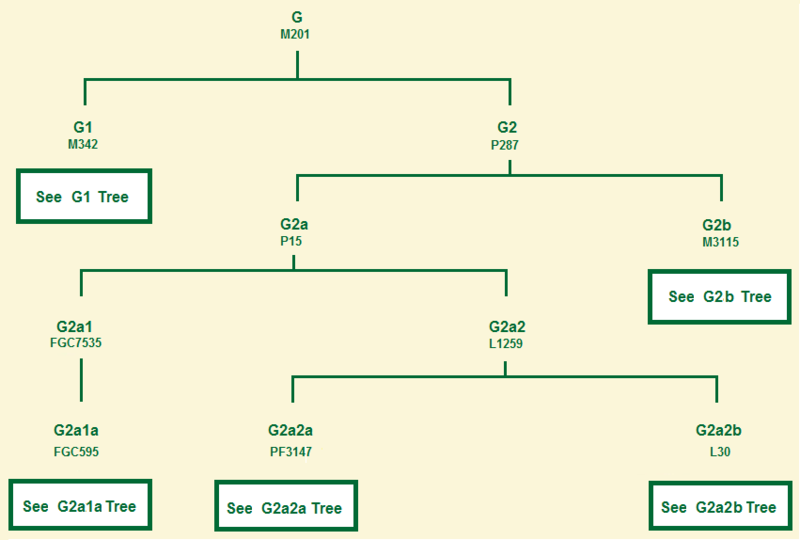 G2a2a1a1b1-FGCC6629/FGC6634, formed 1,300 ybp, TMRCA 300, genealogical 530 ybp. G2a2a1a1b1a-FGC6628, formed 530 ybp, Dutch (Marres). G2a2a1a1b1b-Y89939, formed 530 ybp, Dutch (Mares). G2a2a1a1b2~FGC34750, formed 1,300 ybp, Belgium (Nolet). G2a2a1a1b3~FGC42426, formed 1,3000 ybp, Belgium (Slootmaekers). G2a2a1a1c~BY157359, formed 7,500 ybp, Poland. G2a2a1a1d-Y93879, formed 7,500 TMRCA 5,400 ybp, Italian and Saoudi Arabian. G2a2a1a2-L91, formed 10,900 ybp, TMRCA 10,000 ybp. In Greece archaelogic finds are in Kleitos dated 6,100 ybp and in Bulgaria 4,759 ybp. This clade is now also found among the Bakhthiari nomads of Iran and, in Northern India, an Uyghur from China, in Czechia it is 3%. Some in the Netherlands, Germany Alsace-Lorraine, Britain and Scandinavia and Maharashtra Brahmins. G2a2a1a2a-FGC7739/Z6488, PF3237, archaeological found in three individuals in Barcin Höyük, Turkey, 8,300 ybp, one find Bulgaria from 7.900 ybp, one in a find in Croatia from 4.700 ybp; today in an Iranians. G2a2a1a2a1-PF3239, Z6128, Z6490, formed 10,900 ybp, TMRCA 10,000 ybp in an archaeological find in a Bell Beaker individual in Hungary from 3,700 ybp, now in Sardinians and a Dutchman in Limburg. G2a2a1a2a1a-L166, formed 7000 ybp, TMRCA 6800 ybp, came in Europe probably with the Bell Beaker culture and is now found in Bulgaria, Germany in Frankenland and Bavaria (Krause family), in Greece on Lemnos, in Italy on Sicily and Sardinia and in France on Corsica (20), and in the Pundjab of Pakistan. G2a2a1a2a1a-FGC5672/Z6500, formed 6800 ybp, TMRCA 6300 ybp, found in the mummy of the Ötzthal in Tirol, Austria, a man who lived there 5,200 ybp, in the Chalcolithic, the copper Age, popular named Ötzi. G2a2a1a2a1a1-FGC5674/Z6494, formed 6,300 ybp , Italy, Germany, Czech rep., Sardinians, Germans and in Punjabis (descendants of soldiers of Alexandros the Great of Macedonia?) with a TMRCA 5000 ybp. G2a2a1a2a1a1a-Z6211, formed 5000 ybp, TMRCA 3700 ybp. G2a2a1a2a1a1b1-Z31442 TMRCA 3750 years, Italia, Pundjab in Pakistan. G2a2a1a2a1b-Z6802, PF3230, 2% of all Sardinians. G2a2a1a2a1b2-PF3144. TMRCA 2000 ybp, Puerto Rico, Sardinians. G2a2a1a2a2-FGC2315, 8.800 years old, archaeological find from 8,200 BP in Barcin Höyük, Narmara Region NW Turkey; offspring now in Germany, Sardinia Italy, Tunisia, France (Perez), Georgia (Mamisashvili). G2a2a1a2a2a-Z6773, Z6301. TMRCA 7.800 ybp. already in Sardinia. G2a2a1a2a2a1b1-Y85685, TMRCA 400 years, German (Vonderlack), Dutch (Maryniak, Albers). G2a2a1a2a2b-FGC2308, Z12211. formed 10,200 ybp, TMRCA 3,500y. G2a2a1a2a2b1~FGC2281/Z12219, Tunisians (Per.) formed 3,500 ybp. G2a2a1a2a2b2~BY171991, Irish (O'N. ), formed 3,500 ybp. G2a2a1a2a2c~CTS2080.1. Sicilia, Tirol, Austria, and Denmark. G2a2a1a2b-Z42562, Z42572, TMRCA 8,200 ybp. G2a2a1a2b2~Z45931, formed 8,200 ybp, TMRCA 3,300 ybp, England. G2a2a1a2b2a~Z45935, formed 3,300 ybp, (L.) England. G2a2a1a2b2b~A20616.2, Z46164, formed 3,300 ybp, (H.) England. G2a2a1a3-FGC34625, formed 10900 ybp, TMRCA 9400 ybp, an archaeological find in Cueva de los Murciélagos near Cordoba in Castilia, Spain, 7245-7025 BP, another find in Portugal, 3500-2000 BP, now Georgians, English. 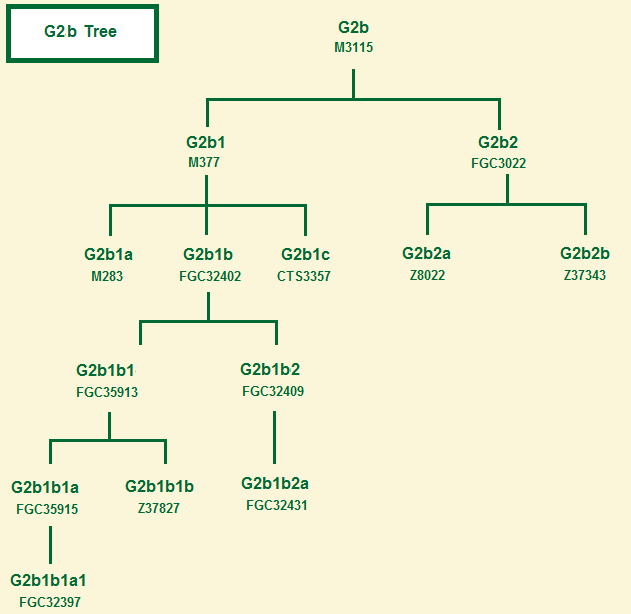 G2a2a1b-FGC34451, formed around 11.400 ybp and split a millennium later in subgroups. Is found among the Early Neolithic Farmers of Halberstadt-Sonntagsfeld in Germany 7,211-6,963 cal ybp and in archaeologic find (klei10) in Kleitos Greece 6.100 ybp. G2a2a1b1-FGC34387, formed around 10.900, in Dravidian-speaking Brahui cattle herders and the Punjabi-speaking Pakistani (Khan). G2a2a2-Z36520, formed 10.100 ybp, TMRCA 10.000 ybp. G2a2a2b-Z36525, formed 11.800 ybp, TMRCA 9800 ybp. G2a2a2b1-BY37102, Y106682, formed 9800 ybp, TMRCA 5900 ybp. G2a2a2b2-Z45667, TMRCA 4200 ybp, Ukrainians. G2a2a2b3c~Z45714, Z34514.2, TMRCA 400 ybp, Puerto-Ricans from Spain. The predominantly Southern European, Mediterranean and Levant groups. G2a2b1-M406/PF3285, formed 14400 ybp, TMRCA 8700 ybp, originated in Turkey 14.900 ybp, and entered Italy probably about 5,000 ybp. This is the clade of Asia Minor and Southern Europe. Of the G men in Iraq, Turkey, Greece and the Balearic Islands, about 50% belong to this clade; in Georgia, 25% (G2a1a is almost 8%); in Italy, 20%; in Spain and the Netherlands, 15%; in Switzerland, 8%; Iran, 6%; and in Poland and UK, 4%. Split in three groups presumably nearly at the same time probably in the Upper Euphrates Valley at the end of the Pre-Pottery Neolithic B (PPNB), when the climate became much hotter and drier around 8400-8200 ybp. G2a2b1* is found in a Lebanese chistian. G2a2b1a1a-L14/U16, age 8,200 years, in Middle Easterners, Italians, Sardinians, English, French, Netherlands, Qatari. G2a2b1a1b-Z17887/Y6222, formed 8100 ybp, Turkey. G2a2b1a1b1a-Z37368/Z377374, formed 6500 ybp. Italian. G2a2b1a1b2a-L645, Armenians, Swiss, and Germans. G2a2b1a2-M3302, Turkey (Armenians), Pakistan (Pashtuns), Italy, U.K..
G2a2b1b-PF3293, age 8,700 ybp, Middle East, Sardinia, Kazakhstan (originally from Ukraine), Palestinians and Sephardic and Ashkenazi Jews. G2a2b1b1-PF3296/PF3316, age 7,300 years, in Iran, Kazakhstan (Russia), Druzes, Italians. Sardinians, in the Netherlands, Ashkenazi Jews. G2a2b1b1a1a~PF3286, Sultans Ba'Alawis of Yemen, Sultans of Siak on Sumatra-Indonesia, Richard III of England, so probablement les Maisons de Plantagenet et d'Anjou. G2a2b1b1a2a2-S9591, formed 5300 ybp, TMRCA 3800 ybp. G2a2b2a1a-PF3346 archaeolgical find of Baden culture in Budapest Hungary 5300-4850 ybp; a Rajput in India. G2a2b2a1a1a-U1/Z6779, is presumably 10,000 years old. The early years of U1 seem to have been during the hunter-gatherer period, before historical records were kept, so little can be said about it until scientists are able to identify U1 subgroups in ancient skeletons from that time period. The more recent aspects of the historical period are covered in the discussions of the subgroups. The Hazara DYS393=15 occurs within the tribal group consisting of Shia Muslim men of central Afghanistan who are distinctive for their heavy intermingling with the C3 Genghis Khan, group which undoubtedly came to Afghanistan with the Mongol invasion. It is possible that the Mongol invasion brought these men from somewhere in southwest Russia, since other tribal groups in Afghanistan lack similar G members in the sampling. G2a2b2a1a1a-U1* is still in Italy. G2a2b2a1a1a1-L13/U13/L78, is about 10,000-11,000 years old. 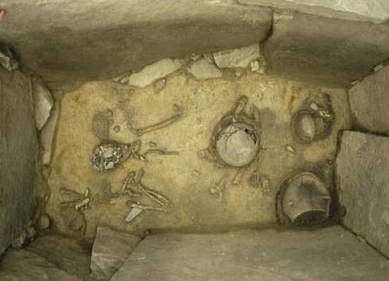 In an archaeological find in Barcin Höyük N-W Turkey dated about 8300 ybp. In its subclades it is found among Germans, French, Swiss, northern Italians, UK an Ukraine, Belarus, Western Caucasus, Georgia, Armenia, and in small amounts outside Europe in Iranian Azeri, Arabs, Druze of the Levant, Palestinians in Lebanon and Syria and Sephardic Jews. The Ashkenazi Jews have DYS588=13 and often DYS568=9 as well. G2a2b2a1a1a1-L13/U13/S13* in Armenia and Italy. G2a2b2a1a1a1a-CTS9909/Z2022, formed 4900 ybp, TMRCA 3900 ybp, they most likely came in Western Europe in the Bronze Age, together with the R1a and RIb population. Most known samples come from Europe. The percentage in G samples in Europe is: Germany 16%; Italy 11%; the Netherlands 10%; France 10%; Poland 9%; Spain 9%; Ireland 6%; England 5%; Switzerland 4%. Some Arabs from Bahrain, Persian Jews from Afghanistan and Morocco berbers. G2a2b2a1a1a1a1-FGC965/Z6759, FGC995/Z6758, 4,000 years old, has a heavy concentration in Europe. G2a2b2a1a1a1a1a-FGC998/Z6764, has a heavy concentration in Europe also in the Netherlands, in Cyprus, Bahrain, Arabs, Algerians, Berbers in Morocco. 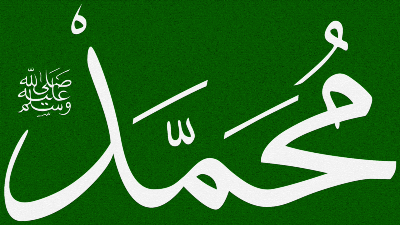 (Mehri). G2a2b2a1a1a1a1a1-Z29424, formed 3,600 ybp, TMRCA 3200 ybp, Germany, Swiss (Beyeler), Italy, Italian Alps (Herbet), Cypress. Poland, Jews, Hispanics, Syrians, Kurdish, and Persians. G2a2b2a1a1a1a1a1a-L1263, formed 3100 ybp. TMRCA 2500 ybp, Turkeys, UK. G2a2b2a1a1a1a1a1a1-Z38846, formed 2500 ybp, TMRCA 1350, Germans, Austrians, Dutch. G2a2b2a1a1a1a1a1a1a-Z38853. formed and TMRCA 1350 ybp, Germans. G2a2b2a1a1a1a1a1a2-Z30781, formed 3.300 ybp, TMRCA 2000, UK. G2a2b2a1a1a1a1b-Z2017. formed 3.500 ybp., Spain, England, Turkey (Jews). G2a2b2a1a1a2-L1266, formed 10000 ybp, TMRCA 7500 ybp, includes half of the West Caucasians, like the Adyghes, Abkhazians, Circassians, Kipchaks, Abazins and Karbardinians and Georgians. G2a2b2a1a1a2a-L1264/L1265/L1268, formed 7500 ybp, TMRCA 3500 ybp, they most likely came in Western Europe in the Bronze Age, together with the R1a population, now in Russia (Kabardinians), in the northwestern Caucasus, primarily among the Adyghians, Ossetians, Tetchens and Senkelens of Central Russia and the Urals, and in Hungary. G2a2b2a1a1a2a2-FGC21495, formed 3500 ybp, TMRCA 3400 ybp, Belgians. G2a2b2a1a1a2a2a1-FGC21497, Belgians, formed 4.000 ybp. G2a2b2a1a1a2a2a2-Z31275, Kabardinians, formed 4.000 ybp. G2a2b2a1a1a2a2c-FGC21497, Belgians, formed 4.200 ybp. G2a2b2a1a1a2b-PH1780, 1950 years old, Georgians, Armenians Iranian Azeris, UK and some Germans. G2a2b2a1a1b-L497/S317/CTS1899/PF6851/Z738, formed 10600 ybp, TMRCA 7200 ybp, This is the largest European subgroup, to which half of the European G, belongs. It seems that G-L497, which is one of the most "European" of haplogroups, spread out from Western Anatolia (where it's found in small numbers) to the Danube Basin with the First Farmers, around 8400-7800 ybp. 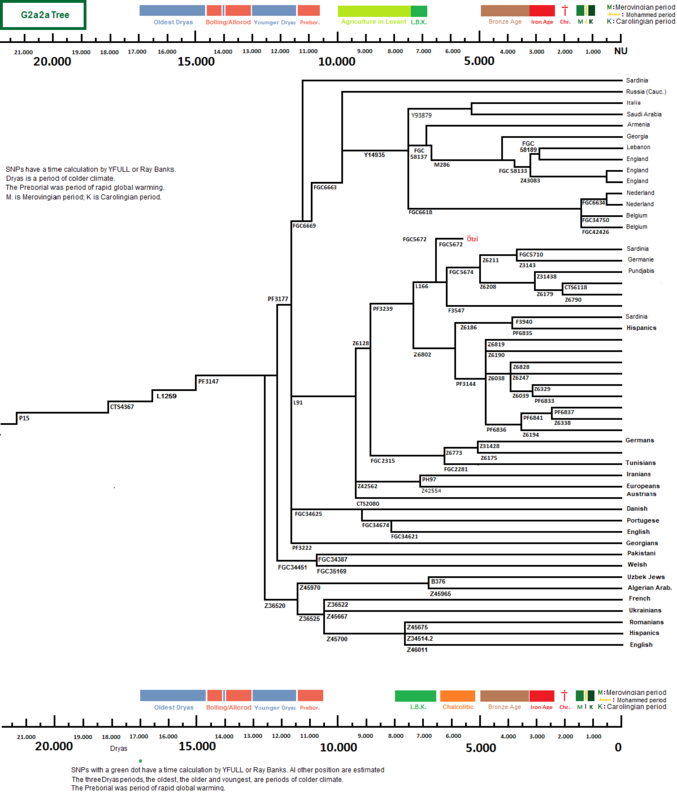 So far, the earliest branches of L497 are found in Italy and the Netherlands. The Anatolian and Aegean L497s are more "derived" (further down the tree in G-Z725), This group is distributed as follows: Tirol 80% of the G samples; Switzerland 75%; Spain, France and Germany 60%; UK 52%, the Netherlands and Italy 44%. They formed the first wave of farmers entering Europe who started the Neolithic, recognizable by the LBK culture. G2a2b2a1a1b-L497*, an American of Dutch origin in Gelderland. G2a2b2a1a1b1-Z1815/CTS9737, formed 7300 ybp, TMRCA 6400 ybp, archaeolgical find of Baden culture in Budapest Hungary 3300-2850 BCE. G2a2b2a1a1b1a-CTS11352/Z1817,, formed 6200 ybp, TMRCA 4600 ybp, is found throughout Western and Central Europe, and especially in Germanic countries. G2a2b2a1a1b1a1-Y7538/Z725, is formed 6400 ybp, TMRCA 4600 ybp. G2a2b2a1a1b1a1a-AMM042/CTS2230/Z1823, formed 4600 ybp, TMRCA 4600 ybp., Norway, Denmark. G2a2b2a1a1b1a1a1-L43/S147, formed 4600 ybp, TMRCA 3800 ybb. G2a2b2a1a1b1a1a1a-L42, formed 3800 ybp, TMRCA 3800 ybp. Spain, is found in a Trypillian outlier individual. This branch might have been assimilated by Proto-Indo-Europeans through contact with the Late Trypillian people who moved to the Pontic Steppe and merged with Yamna tribes. It would later have spread around Germanic and Celtic countries alongside haplogroup R1b. G2a2b2a1a1b1a1a1a1-Y11074/Z30641, Y10621/Z30642, formed 3800 ybp, TMRCA 3600 ybp. Italia, Switserland, Deutschland, Croatia, Finland. G2a2b2a1a1b1a1a1a1a-Y11076, formed 3600 ybp, TMRCA 3600 ybp. Switserland. G2a2b2a1a1b1a1a1a1c-45255, archaeologic find 300 CE, München Bavaria. G2a2b2a1a1b1b-S10458, Italy, France, Poland (nob. ), Germany, Netherlands (Gelre, Limb). G2a2b2a1a1b1b1b1a2-Z40857, TMRCA in late Middle Ages, Welsh. G2a2b2a1a1b2a-Z39088, Italy, Netherlands, 6 KY .
G2a2b2a1a1c1-Z724, N. Italy, Denmark, a tiny number of Ossetians and a Han Chinese from Beijing, and a group in Gao, Mali (Africa) problaby from Morocco. G2a2b2a1a1c1a-CTS5990/Z1903 The earliest archaelogical find is from Chalcolithic Bulgaria around 6700 ybp, the TMRCA of all G-Z1903s today is at 4800 ybp. Now in Greece, Italy, Spain, Germany, France, Belgium, Netherlands, UK., Sardinians and in Ashkenazi Jews. G2a2b2a1a1c1a1-CTS7045, formed probably around 4500 ybp. G2a2b2a1a1c1a1b1a-FGC7477/Z6523, Sierra Leone, n.e. Europe (Ashkenazi Jews), Romania, U.K.
G2a2b2a1a1c1a1b1a1b-FGC31715, exist for abt 1,500 yrs, Ashkenazi Jews. G2a2b2a1a1c3a2-Z6032, Sardinians, French, Sephardim, Ashkenazim and Araite jews, Christian Arabs from Syria and Lebanon, Berbers, Mende people from Sierra Leone, Ossetians, and a Han Chinese from Manchuria. G2a2b2a1a1c2b-Z16670, 19-21th century rulers in nowadays Saudi Arabia. G2a2b2a1a1e-Z30708, Middle Easterners, 11.000 years. G2a2b2a1b-Z30527, 11.000 years. Ukrainians, Iraqi Jews. G2a2b2a2-M278, Greeks, Spanish, present in the Medieval Jewish population of Spain in the 14th century. G2a2b2a3-Z6885, archaeological finds have been made in the Anatolian Neolithic from Barcin Höyük in Northwest Turkey from c. 8300 BP (6500-6200 BCE) and the Linear Ceramic Culture - LBK - from Scheltz, Austria, 6950 BP (5500-4500 BCE. And nowadays in Armenians, Syrians, Al-Muntafiq Tribe of Southern Iraq (Hellenistic Greeks from the Seleucid Empire?) and Arma people an ethnic group in subsaharan Africa in the Niger River, descended from Moroccan and Andalusi invaders of the 16th century. G2a2b2a3a-Z39310. Archaeological find in a sample dated 7000 BP c. 5040-4850 cal BCE from the El Toro Cave in Antequera near Málaga, South Spain. This Andalusian Early Neolithic culture is thought to have arrived just prior to the Cardial technology. G2a2b2a4-Z30503, formed 11.700, TMRCA 7400, Brahui, Kalash and Punjabis. G2a2b2a4a-Z40458. formed 7440 TMRCA, TMRCA 6600, Iraqis and Indians. G2a2b2a4a1-Z30522. Lyengar Brahmins and Bhargava in India. G2a2b2b-PF3359, formed 14400 ybp, TMRCA 12200 ybp, was under the earliest Anatolian Aceramic Farmers of Boncuclu, is found in the following cultures: LBK, Iberia Late Neolithic, Varna Eneolithic, Iberia Chalcolithic, Nuraghic of Sardinia, a Hungarian Scythian of 392 BCE, a Viking Age Sweden from 870 CE, Musawi Sayyid from Iraq, Armenians, Southeastern Turks, and Southwest Iranians, Arabs, Crimean Tatars, a Kabardinian, a Moksha, a couple of Armenians, non-Ashkenazi Jews, a Central Greek, Cretans, Sardinians (here it is 25% of the G), Corsicans, a Hungarian, a German, a Brit, and in the Netherlands. G2a2b2b1-F1193, formed 12200 ybp, TMRCA 11800 ybp. 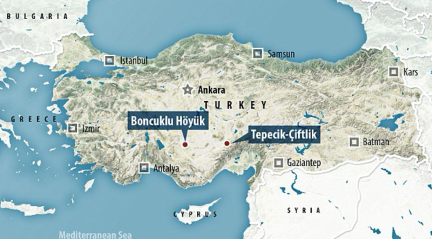 G2a2b2b1a1-F872, formed 11500 ybp, TMRCA 8900 ybp, Epipaleolithic Central Anatolia Boncuklu 10,200 ybp. G2a2b2b1a1a-PF3378, formed 8900 ybp, TMRCA 5800 ybp, two Chaloclithic samples from El Mirador Cave, Atapuerca, Burgos, Spain, 4850 ± 150 ybp, Hungary 2480 ± 40 ybp, nowadays in Italia, Sardinia and Germany. 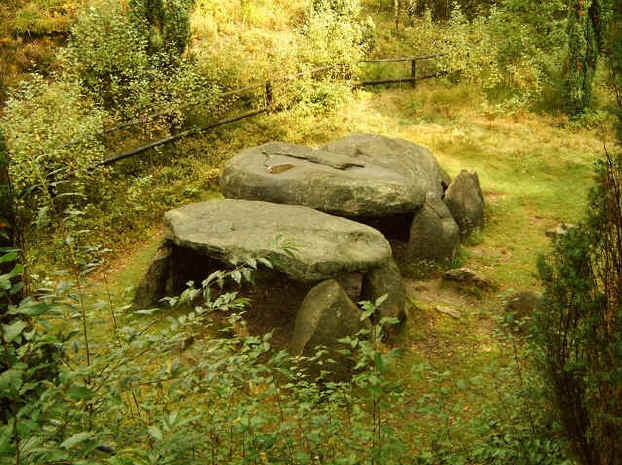 G2a2b2b1a1a1-PF3420, PF3376, formed 5800 ybp, TMRCA 4800 ybp, Sweden in butial grounds in Sigtuna, 10 to 12th century. G2a2b2b1a1a2	Z7016, formed 5800 ybp, TMRCA 5200 ybp, Italia and Netherlands. G2a2b2b1a1b~-F2572, formed 8900 ybp, TMRCA 8600 yb. G2a2b2b1a1b1a F2214, formed 8600 ybp, TMRCA 8500 ybp. G2a2b2b1a1b1a2 ~F807, formed 8500 ybp, TMRCA 2000 ybp, Netherlands. G2a2b2b2-PH488, formed 12200 ybp, TMRCA 7900 ybp, Romania Early Neolithic, Armenia, Iran, Palestina. G2a2b2b2a-CTS1455, PH236, formed 7900 ybp, TMRCA 3500 ybp, Poland. G2b-M3115, formed 20800 ybp, TMRCA 19900 ybp. G2b1-M377, formed 19900 ybp, TMRCA 8900 ybp, Lebanese; in subgroups is found in Lachin, Nagorno-Karabakh, in an Armenian noble family, in native Syrian Christians and their Lebanese Maronite descendants, in Italy, Sicily, Spain, Saudis of Khorasani origin, Kars Province Turkey, as well as among Ashkenazi Jews and Pashtuns in Pakistan where it reaches till 14.7% in who claim Israelite ancestry and to be descended from a regular Jewish "Benjaminite" community in Khroasan (Eastern Greater Iran) who converted to Islam at the time of the Mongol Invasion in 1220 CE. G2b1a-M283, Italians in Sicily, Pakistani, Afghans. G2b1b1-FGC35913/Y15861/Z35318 , formed 1250 ybp, Ashkenazim. G2b1b1a-FGC35915/Y15862/Z35608. Lithuanian Jewish and Belarus who are probably come from France. TMRCA of the parent 1100 ybp. G2b1b2-FGC32409/Y14601, formed 1250 ybp, Ashkenazim. Roemanians and Ukrainiens. G2b1b2a-FGC32413/Y14600, formed 1250 ybp, Ashkenazim. Roemanians and Ukrainiens. G2b2-FGC3022, Italy, Armenians in Turkey, . G2b2a Z8022, an archeological find in the Zagros Mountains of Iran, 9,250 cal.BP, now in North Jordan and South Syria, but, Southern Syrians. Jordanians, Italians. The oldest archaeologically find, which has been determined to belong to the Y-DNA haplogroup G, is a man who had G2b. His remains are found in the Wezmeh Cave in the Zagros Mountains, the far west of Iran. He lived 9,250 cal.BP. 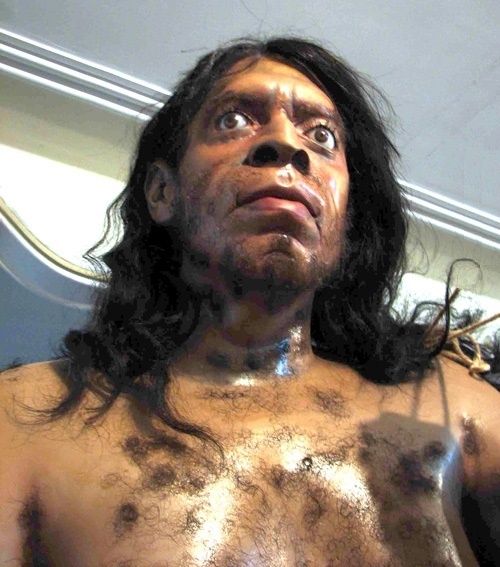 He most likely had brown eyes, relatively light skin, and black hair, although Neolithic Iranians carried reduced pigmentation-associated alleles in several genes and derived alleles at 7 of the 12 loci showing the strongest signatures of selection in ancient Eurasians. 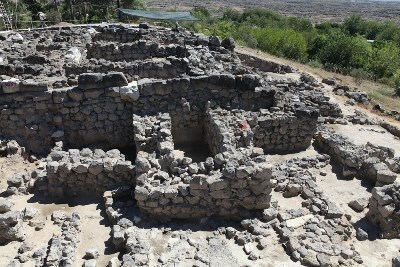 Human remains are excavated from two different Neolithic settlements in Cappadocia in central Anatolia, in and in Tepecik-Çiftlik and hereof were investigated a total of nine ancient individuals, 4 excavated in Boncuklu and 5 in Tepecik-Çiftlik. In both was one man with haplogroup G.
In the Aceramic Neolithic Boncuklu an G man is found (Bon004) who lived 8,300 BCE, 10,300 ybp. 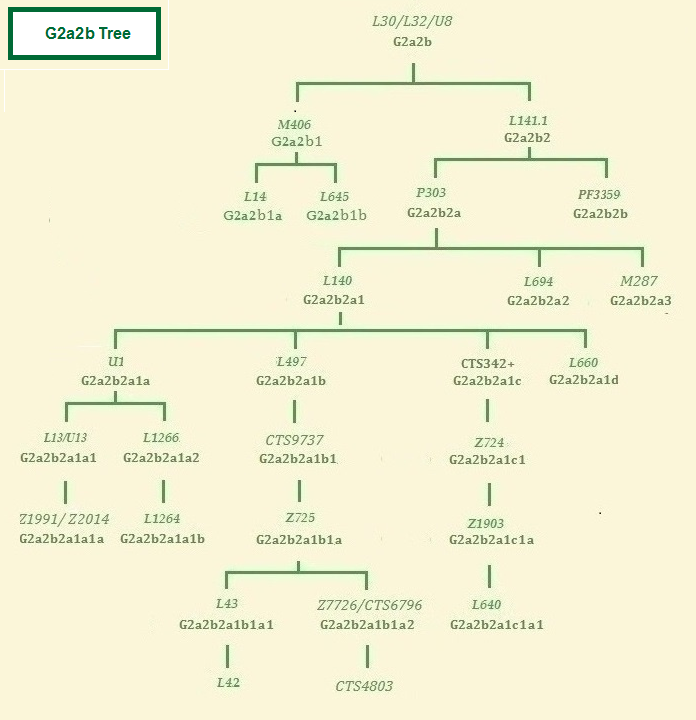 and his clade is G2a2b2b-PF3258. In the Pottery Neolithic Tepecik-Çiftlik the G man (Tep003) lived circa 6,500 BCE, 8,500 ybp, and he is G2a2a-PF3147, because he is PF2159+. G2a2b2a1a1-L78 an equivalent of L13 is found in an archaeological find in Barcin Höyük, N-W Turkey dated about 8300 ybp and G2a2a1b- is the oldest archaeologically found G in Europe from a burial ground in Kleitos in Northern Greece dated round thre same time. Here farming and sedentism first appeared in Mediterranean and Central European. The dead person was buried on his left side with his head facing east. From nearly the same period are the archaelogical finds in Starčevo in North-West Hungary and the finds of the Linear Band culture in the Carpathian Plane in Central Hungary, 8000 to 7000 ybp, old. These are the earliest settlements of the Neolithic culture in Europe. 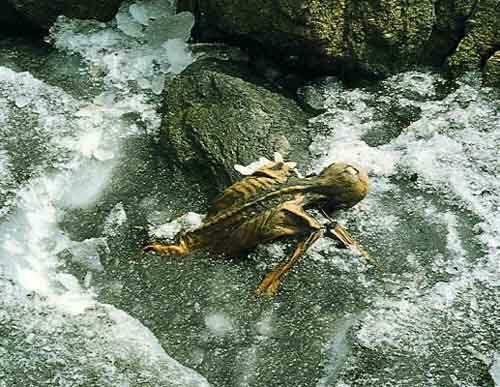 This is the oldest human mummy, found to date in Europe and had been well preserved by glacial ice. He had brown eyes, was lactase intolerant, about 55 years old, 5 feet 2.5 inches tall, and probably a hunter. He had a very long bow with him, about 6 feet long, and fourteen arrows, some not yet finished. He also had a copper ax made of 99.7% pure copper. He wore sturdy clothes which had been patched, a hat, and shoes with soles made of bearskin. Considering this relatively expensive clothing as well as tools for hunting and working, it is thought that he may have been a leader. From the chemical analysis of his bones and teeth, one can conclude that he must have be born in the region Bolzano and during a long time of his live lived in Winschgau on the South Slopes of the Italian Alps. He had significant arteriosclerosis, a worm infection, Lyme's disease and joint disorders which may have been the result of this last infection. He had a fresh arrow wound in the shoulder and quite likely bled to death. An arrowhead was found high in his chest; the wooden arrow shaft had been removed, probably by himself. His precious belongings were not removed at the time. He had a full stomach, having recently eaten flour products and deer meat, but he had no food with him. He had rows of dashes tattooed on one knee and on his back, at the lumbar vertebrae, which possibly had a magical-medical significance. And yes, bloodstains from four other persons were found on his clothing, but nothing has yet been announced concerning these. 25 graves from about 5000 years, ago were found in a large Neolithic burial mound in Treilles, Languedoc-Roussillon, in France. Twenty of the twenty-five men had G2a, based on their markers. This is a remarkably high rate of 80%. The other 20% had R1b, and E1b1b. 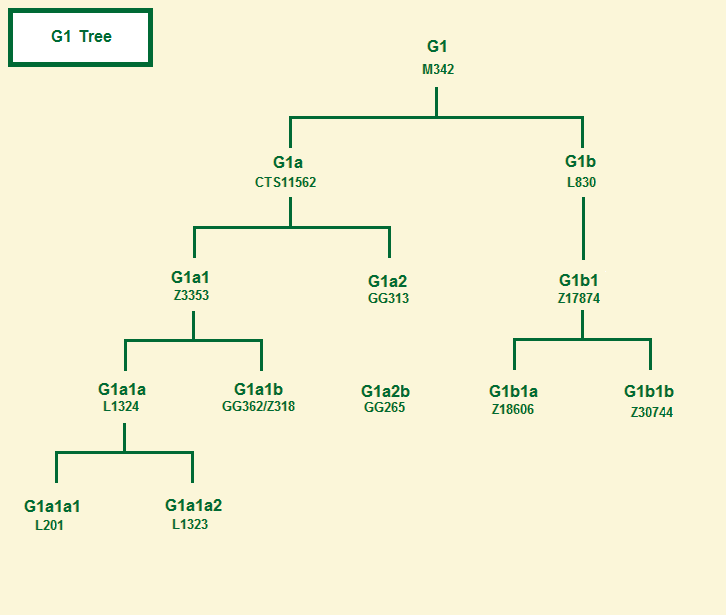 All of the G men had the same haplotype, so they were closely related family members. The low percentage <2% of shared lineages between Treilles and current populations, and the fact that the ancestral and current G2a haplotypes do not seem related, imply that the G2a lineage of Treilles was probably lost between the end of the Neolithic and today. 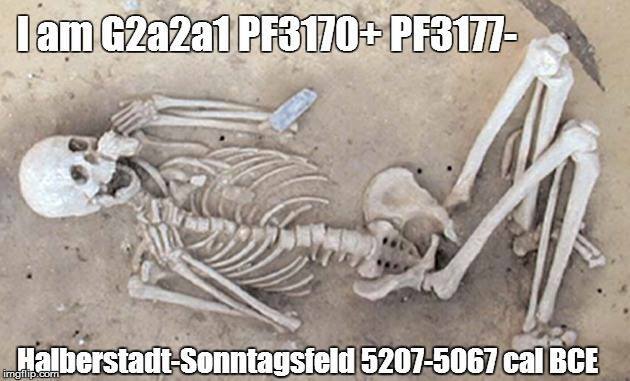 In an early medieval grave in Ergoldingen, in Bavaria (Germany), dated round 670 AD, six men were buried together, two were G2a2, one must have been G2a2a-PF3147 because of his doule DYD19 values, the other had G-Z2022, so was G2a2b2a1a1a1a-CTS9909. They were buried with their swords, spears, and shields, so they were probably knights. Haplogroup G, must have entered Europe during the earliest Neolithic. 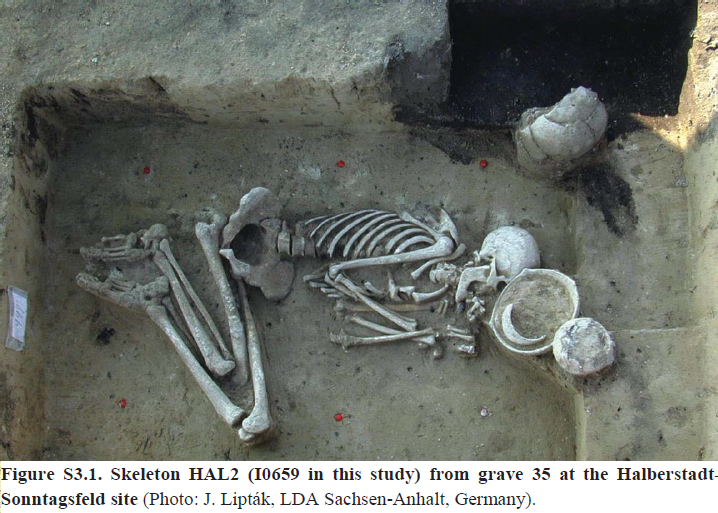 The oldest archaeological graves are found in Hungary, later follow Germany, Italy, France and Spain. Today G is a marginal group in Europe but in the time of the the first farmers nearly 60% of the European population had G. They brought the Linear Band Culture (LBK). They replaced the hunter-gatherers for a big deal and with them the old Haplogroups. Most oldest G samples belong to G2a2a-PF3147, and G2a2b-L30. They form nowadays only 5% of the European population. Today haplogroup R1b1a2-M269, is dominant in Western-Europe, occurring at rates between 50% and 80%. 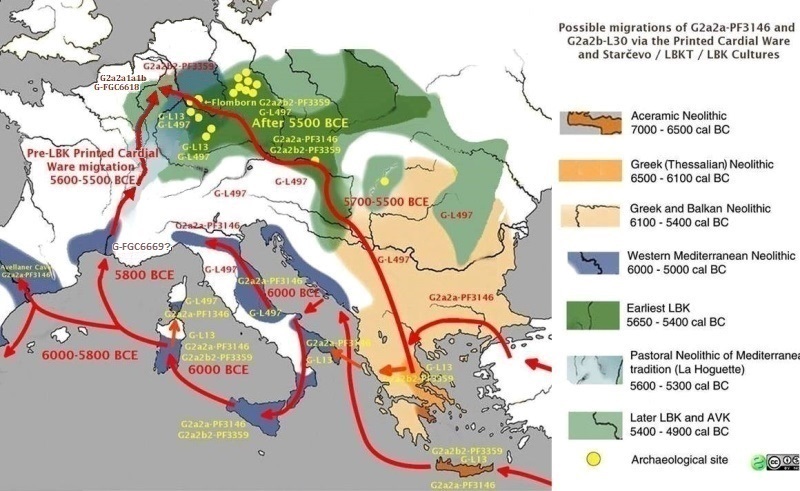 Scholars increasingly think that this haplogroup emerged about 8.000 ybp in Asia Minor and then spread to Europe. They were the second wave of immigrants from Anatolia, bringing with them the Chalcolithic culture , the Copperage in the late Neolithic. After their arrival in Europe, a population explosion occurred within this group and within 1000 years they became the dominant group in an area stretching from Hungary to the Atlantic Ocean. The arrival of this new population is also evidenced in the mtDNA samples, which also show a major change during this same time period: the resident mtDNA being pushed to the edges of Europe. This Alan DNA is discussed along with their history on the Alans page of this website.